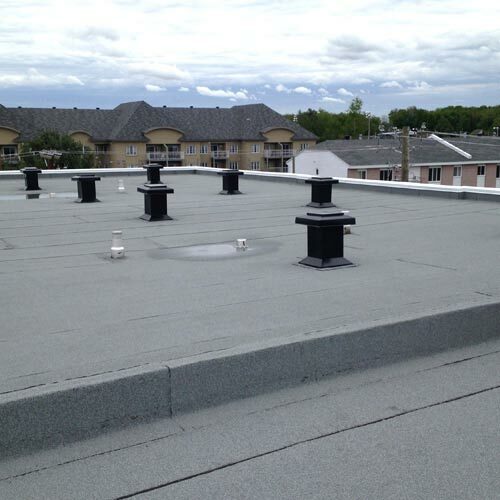 Due to their many advantages, flat roofs are very popular in Quebec for both residential and commercial buildings. Even though flat roofs are known for their strength, without proper maintenance, there is an increased risk of dampness and mold. Quebec’s harsh climate puts roofs to the test. You will need our extensive expertise to help ensure that your investment provides you with peace of mind. Thanks to the availability of a wide array of materials with specific attributes, flat roofs provide virtually endless solutions. Toitures PME specializes in all types of flat roof coverings. Our professionals provide quality service and practical assistance for making the choice best suited to your project. Depending on the type of building, location, climate, budget and personal preferences, Toitures PME will help you select the type of flat roof that best meets your needs. Regardless of whether you opt for gravel, asphalt or elastomeric membrane for a flat roof, Toitures PME professionals will ensure the best possible installation, repairs and maintenance. We are known for the high quality of service we provide. When you do business with us, you will get a roof with a maximum life span and minimal problems. In order to avoid any unpleasant surprises, trust Toitures PME professionals for all your flat roof needs.